Kirkland, WA – Crelate, the recruiting software company that enables business to collaboratively manage hiring and opportunity pipelines, today announced that it has been named the “Most Implementable” Applicant Tracking System by G2 Crowd, the world’s leading business software review platform. G2 Crowd created the 2017 Applicant Tracking System Implementation Index to rate ease of implementation of leading applicant tracking systems (ATS) according to feedback from users of each ATS. The purpose of applicant tracking systems is to “reduce the time spent reading resumes and screening potential applicants,” so the ease of setup is a critical factor on solution time-to-value and directly impacts a software’s ability to improve hiring efficiency for recruiters. G2 Crowd rated applicant tracking systems based on a comprehensive set of implementation factors: ease of setup, implementation time, implementation method, user adoption rate, the number of users purchased, and deployment methods. Additionally, G2 Crowd surveyed satisfaction among different client demographics, which they segmented into small businesses (companies with 50 or fewer employees), mid-market businesses (companies with 51-1,000 employees), and enterprises (companies with over 1,000 employees). The index includes two metrics that are critical for small businesses: ease of setup and implementation time. Small and mid-market businesses need lightweight solutions that don’t tax the resources they use to drive growth. To avoid overburdening their time in the process of adopting an applicant tracking system, the process needs to be as quick and painless as possible. So, it’s unsurprising that the software which was easiest and quickest to set up was most popular with small and mid-market businesses. Given the success in the two critical categories for small and mid-market business, it’s easy to understand why Crelate took the top spot in satisfaction among small businesses. This is good news for Crelate, because the company’s primary customers are small and mid-market professional services, staffing and recruiting agencies. It’s an excellent indication that Crelate’s software is a great fit for expanding firms looking to grow their business by finding top talent for their teams and customers. In recent months, Crelate has added and enhanced features in the software to improve the workflow and filtering options offered by their system. The overall goal of these improvements is to make the visualization in the Crelate applicant tracking system dynamic and efficient for day-to-day use. The Crelate team has been working to bring the power of enterprise software to firms of all sizes. Creating a unified Recruiting CRM and applicant tracking system that is easy and quick to get up and running is a major factor in building a single, unified recruiting solution that small and mid-market staffing and recruiting firms can use for everything from recruitment to sale. 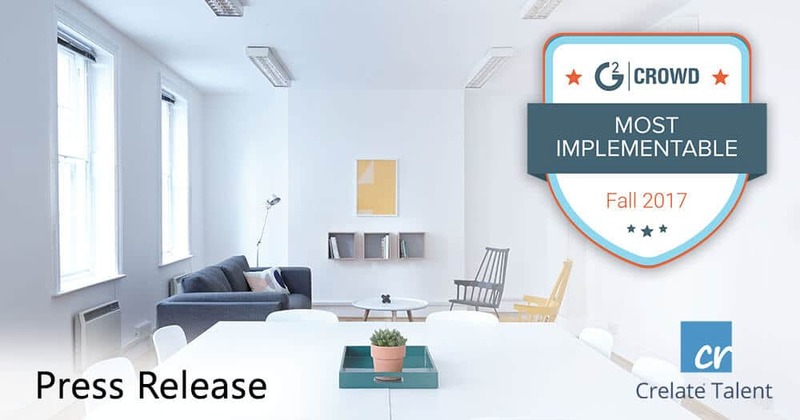 Being named “Most Implementable” by G2 Crowd is confirmation that Crelate’s efforts to build a functional, user-friendly system have hit the mark with their clients. Crelate was founded in 2012, and now serves over 550 staffing and recruiting agencies. Crelate is focused on helping talent-focused businesses navigate an increasingly dynamic and global workforce. Crelate provides a fast, flexible solution that combines the applicant tracking and sales process into a single, unified recruiting system. G2 Crowd real-time and unbiased user reviews help objectively assess the best business solutions. Until recently, selecting business solutions was hard, risky and inherently biased. G2 Crowd empowers business buying decisions by highlighting the voice of the customer. Their review platform leverages more than 270,000 independent and authenticated user reviews read by more than 1 million buyers each month. This model brings transparency to B2B buying—changing the way decisions are made. G2 Crowd’s mission is to provide the insights business professionals need to gain confidence in their buying decisions and become more successful in their jobs. You can get more information about Crelate, and read about the features their applicant tracking system offers at crelate.com.